Online donations are accepted for all major credit cards, bank transfers and PayPal. Transactions are processed safely and securely through Stripe via DonorBox. When you make your gift recurring, you create a reliable source of funding that ensures food for the needy all year long. Just a few dollars goes a long way! Your memorial gift revering the special memory of a person is a loving and generous way to convey your feelings during a time of loss. Alternately, create a tribute gift to celebrate an anniversary, birthday, retirement or other significant occasion. All donations can be designated as memorial or tribute gifts during the online donation process. For gifts of $1,000 or more, your name will be recognized on our donor wall in the St. Francis Xavier Center. Want to know exactly where your donation is going? Cover the cost of a specific bill for one day, one week or one month. Each donation option has been calculated from current operation costs. *Pay-A-Bill donations can be designated as one-time or monthly recurring gifts. This bill covers gas for heating and cooking. This bill covers the cost of removing the trash generated by our dining room and kitchen from our on-site dumpsters. This bill covers supplies such as cleaning spray, glass cleaner, mops, towels and sponges used to clean the dining room, kitchen, restrooms and food pantry. This bill covers all the expenses needed to keep our vans fueled and operational for daily food pick-ups from local grocery stores and donation sites. This bill covers the cost to keep our lights on every day during meal service times, as well as the electricity used to power kitchen appliances and our walk-in industrial freezers. This bill covers supplies such as plastic forks, spoons, plates, napkins, cups, to-go containers and many other food prep materials needed to keep the kitchen running. All online donations are securely processed through Stripe via Donor Box. 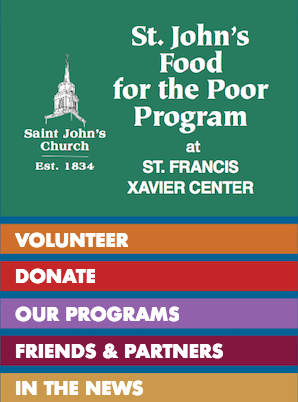 All donated funds will exclusively support the St. John's Food for the Poor Program. A confirmation email will be sent to you immediately after an online donation has been processed. Donations are tax-deductible: Nonprofit 501(c)(3) EIN 04-2106729. Thank you for your support!